In order for a donor to make a payment towards a specific family's balance, an admin user must first add a new payment request to the donor's account. 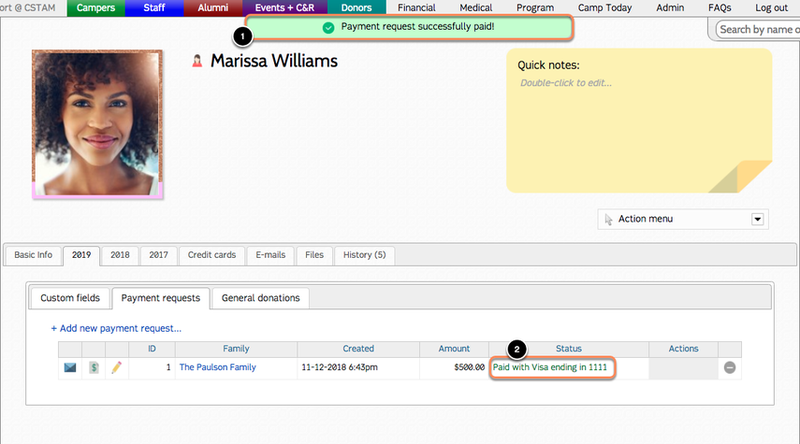 All existing payment requests for a donor will be located under the Payment requests tab of their profile. For each payment request, the donor may submit the payment via the Donor Dashboard; or, an admin user may submit a donor payment manually via the donor's profile page. Select the camp year towards which you want the payment to apply. 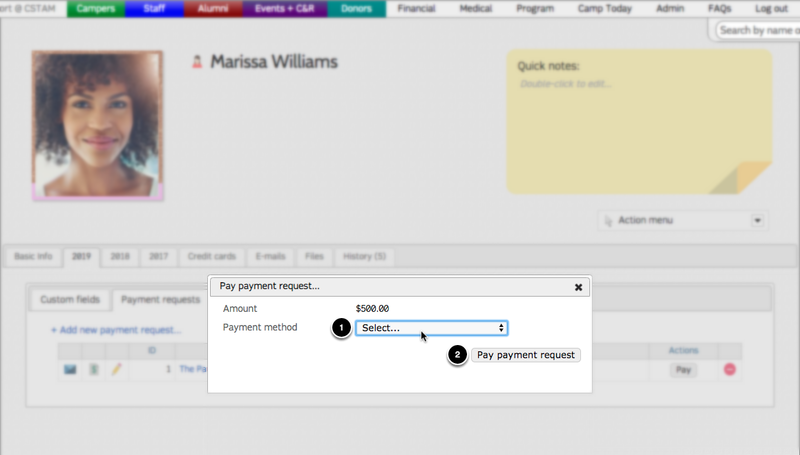 Click to "Add a new payment request"
1. Start typing the last name of the family towards which you want to apply this payment. 2. Select the correct family from the search results that display. 3. Type the amount of the payment. 4. Select the payment schedule group that the family's payment schedule belongs to. 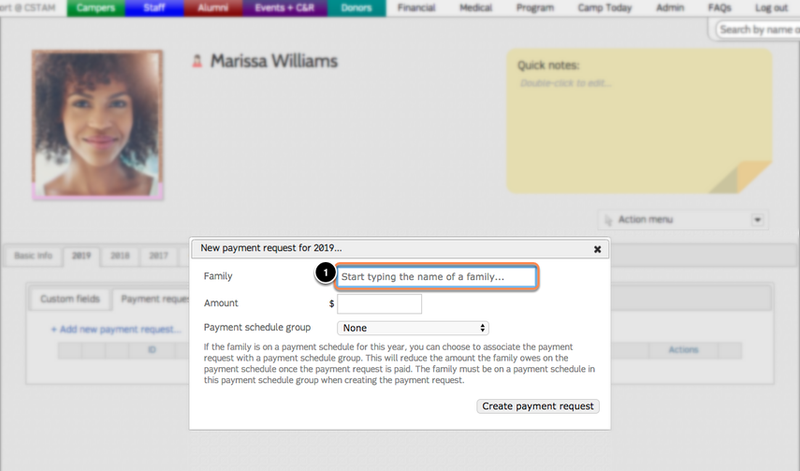 CampSite will then apply this payment towards the family's payment schedule, to reduce the amount the family owes on for this payment schedule once the payment request is paid. 5. 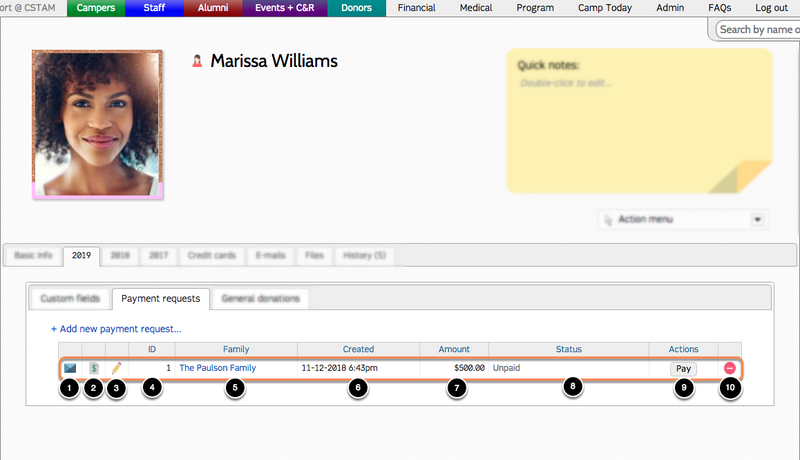 Click to create the payment request on the donor's account. Double click to e-mail this payment request to the donor. Double click to generate a PDF of the invoice for this payment request. Double click to edit the payment request amount and/or payment schedule group it's applied to (these can only be edited before the payment is made). View the ID number for this payment request. Click to navigate to this family's profile page. View the timestamp of when this payment request was created. View the amount of the payment request. View the status of the request (unpaid or paid). Take action towards this request (for unpaid requests, you may click "Pay" to manually post this payment; for paid requests, you may click "Refund" to refund the payment). Double click to delete this request (if it hasn't been paid yet). Admins may manually post a payment towards a donor's payment request via the "Payment requests" tab. Click the "Pay" button for the particular payment request you wish to fulfill. Select a payment method. If you wish to enter a credit card payment, the donor must already have this credit card saved on file. Donors may save a credit card to their account via the Donor Dashboard; or, you may manually add a new saved credit card by navigating to the "Credit cards" tab of their donor profile. Click "Pay payment request" to post this payment (If the payment method for this request is set to "Credit card" or "Checking account," CampSite will begin processing this payment via your payment gateway as soon as this button is clicked). A confirmation message at the top of the screen. A status of "paid" for this request.